The Birthday Party Centerpiece Curse? It’s hard to believe that my princess is another year older. After her Tangled Birthday Party last year, I really fell in love with having a DIY statement centerpiece as a part of her parties. But I admit, it’s hard to top an already over-the-top party. That Rapunzel “B” was amazing, easy and cheap. Surely I could do it again, right? With Moana on the docket for her 6th birthday (which she has been telling me since the day after her 5th birthday), I knew that I had to come with yet another amazing centerpiece for her Moana Birthday Party. 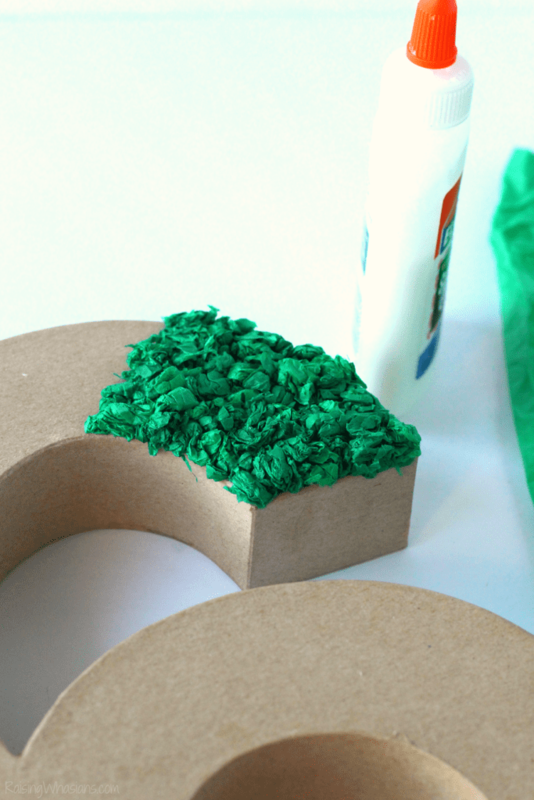 Thankfully, we had a bunch of leftover tissue paper from Christmas – and tons of school glue sitting around. A few rips later and we had the perfect and Easy Moana Birthday Number DIY. So whether your child is celebrating a 1st birthday or a 6th – it’s a great addition to your Moana party ideas on a budget! Therapy, crafting AND a beautiful Disney inspired party centerpiece in one? Heck to the yes! 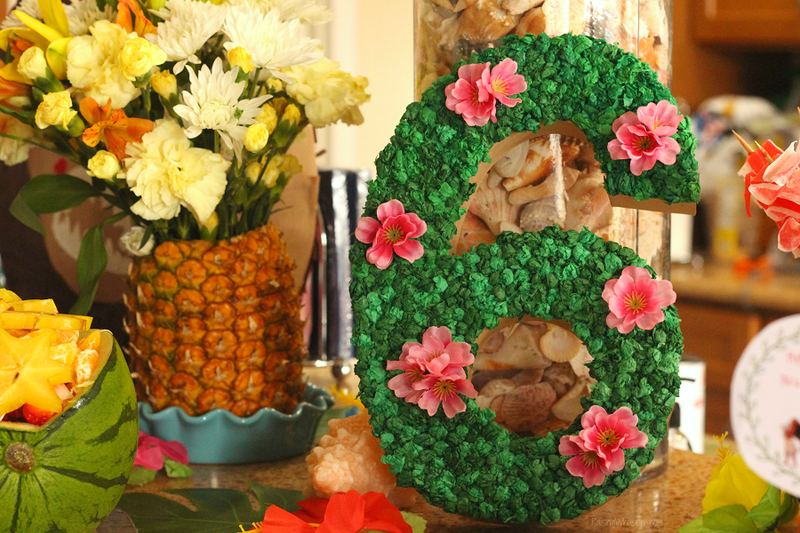 Inspired by Te Fiti herself, this Moana Birthday Number Centerpiece will definitely make your child’s party shine! 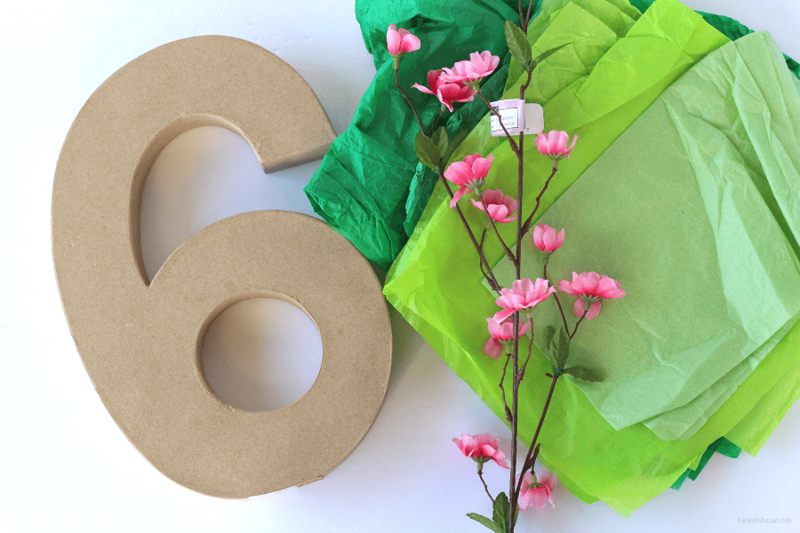 Roll up those wads of tissue paper, my friends, and make this Easy Tissue Paper Number DIY for under $5! Rip your tissue paper into tiny balls, about 1/4 inch thick. Glue your balls to the top surface of your paper mache number. Make sure to keep them tight and random so you fully cover the top of the number. (This is a GREAT time to allow your kids in on the crafting – my daughter LOVED helping to rip up paper.) Allow to dry. Once fully dry, use your hot glue to apply your flowers to the top in whatever design you think is best. Allow to dry. It’s seriously that simple. 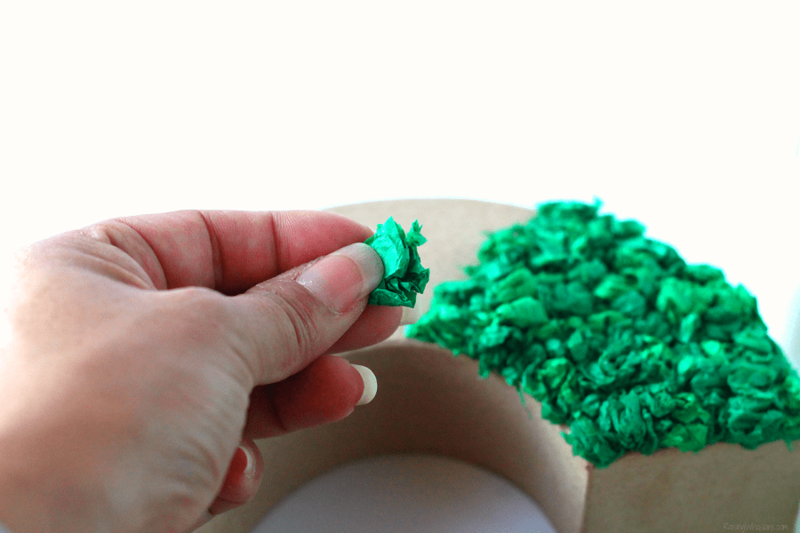 The therapeutic ripping, rolling and crunching of tissue paper to complete a task – it was such a fun craft! 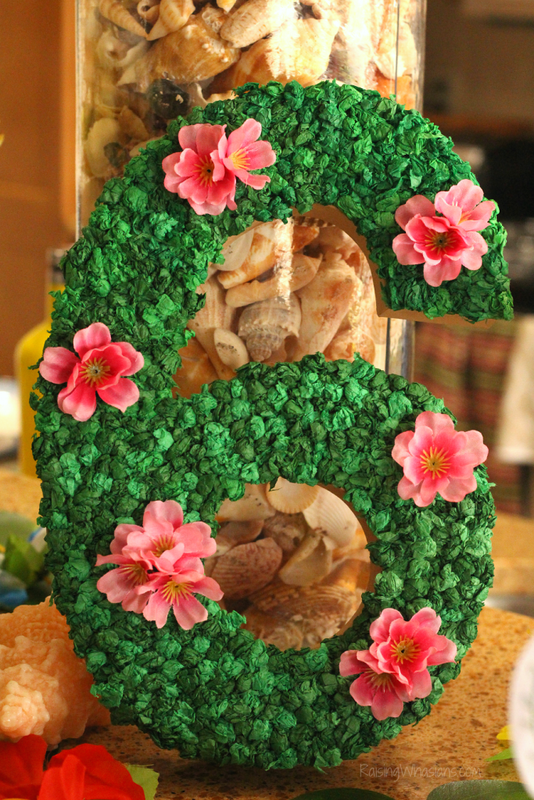 And I couldn’t ask for a better centerpiece to celebrate my daughter’s 6th birthday in style, Disney style! This Easy Moana Birthday Number DIY is the perfect easy party idea for your next Moana inspired birthday party. Don’t forget to grab these FREE Moana Printable Coloring Sheets for the party too! 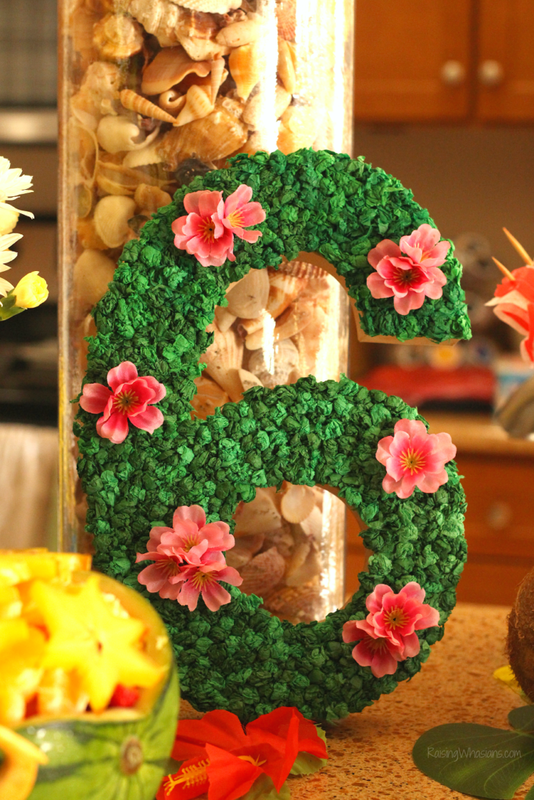 Stay tuned as we unveil more sneak peeks from my daughter’s Moana party. I can’t wait to show you all of the details. 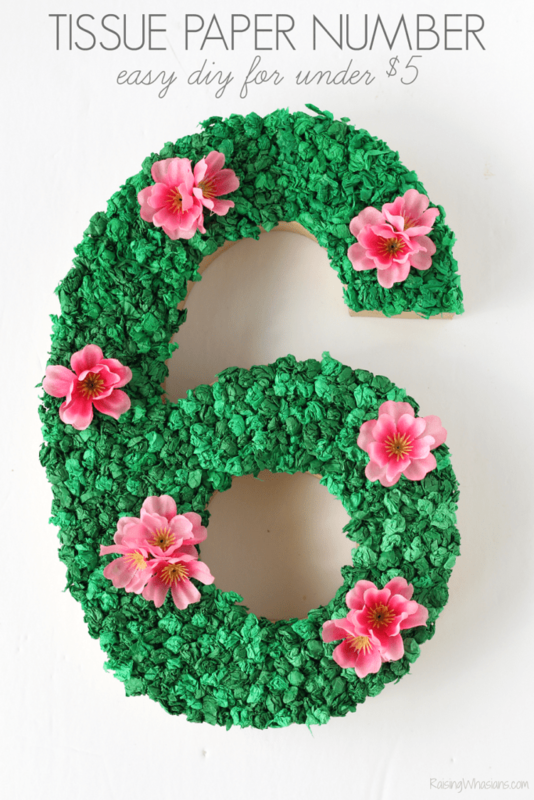 And let me know if you make this Easy Moana Birthday Number DIY. Stay tuned for more from our Moana birthday party! This is such a great simple, but great looking craft. I would totally make this for myself because I love Moana. Can’t wait to see what other Moana themed birthday things you come up with. It turned out so cute! Makes me think of the tissue paper crafting days in school where we used our pencil to create a little polf and stamp them down in there. I like this style of rolling it up tightly, looks very lush. Beautiful! LOVE this!!!!! Thanks for sharing! I love how easy and affordable this is. It really looks fantastic! This is great, my Granddaughter is deciding on what she wants for her birthday, Moana or Unicorn. Thanks for sharing.